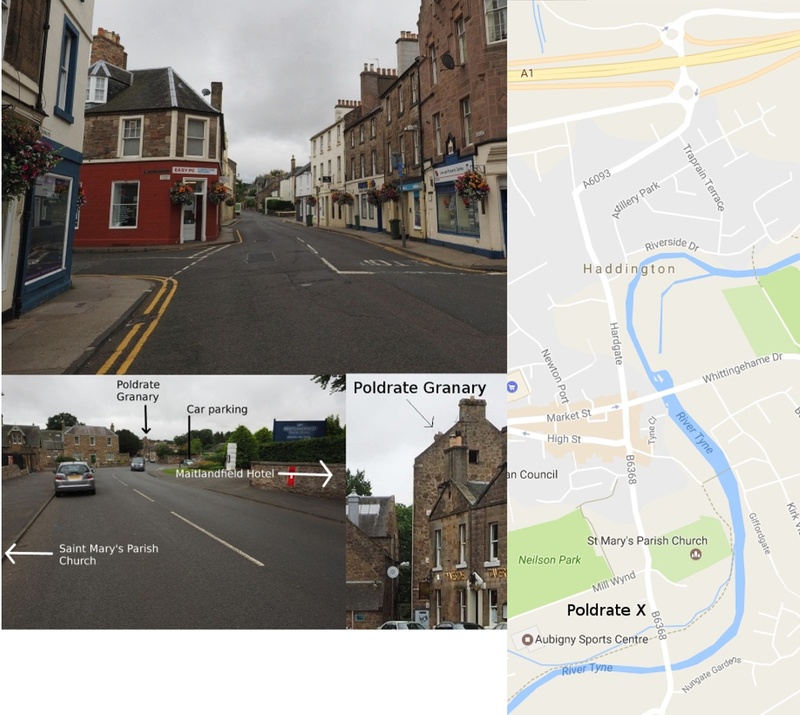 The club meets weekly on Tuesday evenings from (roughly) mid September till the start of April, on the top floor of Poldrate Arts and Craft Centre (PACC) Granary Building, Haddington, EH41 4DA. There is no formal Summer schedule. To get here from the A1. Leave at the Bishop’s View (eastern) junction. Take the A6093 (Dunbar Rd) into town. (From the west on the A199, join the same A6093 at the roundabout past the JET garage.) Follow the A6093 (Hardgate) to the junction with the High Street. Go straight on into Sidegate (B6368). DO NOT bear right into the High Street. (See top photo, below). Go straight on down Sidegate as far as the Maitlandfield House Hotel and find a space to park. The Poldrate Granary is ahead on the right, past the Tyneside Tavern. The Granary is part of an old watermill complex , just a few metres from the river. Nb-Googlemaps is a bit confused. There are two Saint Mary’s Churches, both east of the road, the bigger (parish) church and the Roman Catholic Church closer to Poldrate and currently shown by Google on the Poldrate site. Yay! They fixed it. Poldrate is itself part of the Bridge Centre complex. Coming from the south- cross the old Tyne Bridge and Poldrate is the building on your left beyond the (closed) bistro. The door at the bottom right of the main building is the entrance to the club and has a combination lock. On the first two nights of the season there should be someone on duty at the door to let you in. If not, then buzz the intercom and ask. You will be given the combination number when you join the club — please keep it secret! If you are a wheelchair user, please use the contact form to alert one of the committee before coming to the club. There is a lift inside the main entrance; someone will arrange to meet you there and let you in. There are toilets on the ground floor, left of the entrance.